We are adding two new filters for your alignments. You can now filter by subject sequence length and alignment length. Those filters are particularly important when reviewing motif results. We are also adding HSP (alignment) grouping. 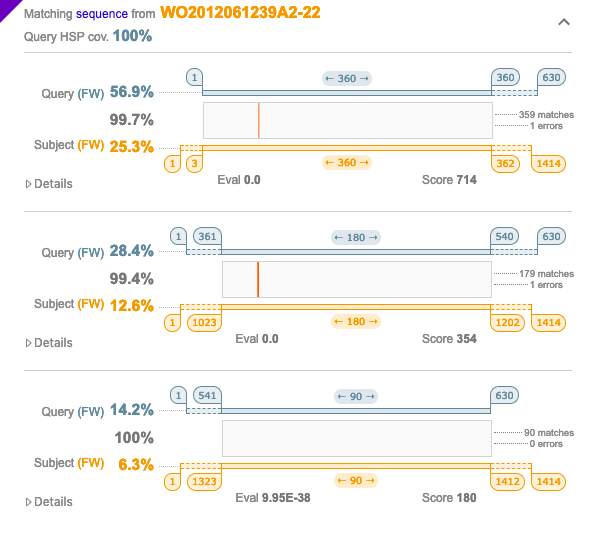 When using a long sequence or when your query sequence is matching a very long gene sequence, algorithms can typically split your results into several small alignments. Those alignments, called High-Scoring Pairs (HSP), are now viewed together. Moreover, the complete coverage of your query sequence is also computed and can be used in the filters.